Tonight I was very pleased, as Convener of the Dundee Fairtrade Forum, to chair a public meeting on Fairtrade in the McManus Galleries. The main speaker was our Malwian Fairtrade producer visitor Masauko Khembo. 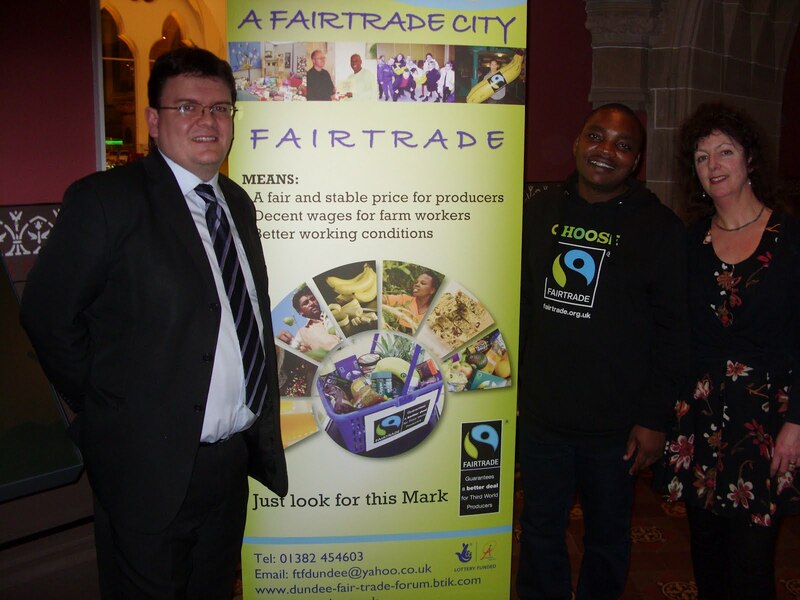 Before Masauko spoke Councillor David Bowes spoke about Dundee City Council's recent moves to improve our Fairtrade policy. 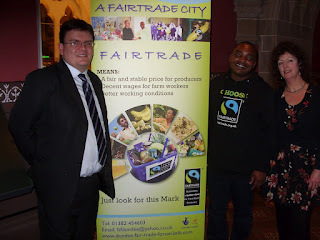 Masauko spoke about the difference Fairtrade is making to his community. It was very interesting to hear about the production of sugar. It was also very interesting to find out how the Kasinthula Cane Growers Association, the co-operative which he works for, invested in improving their community. They have built a new school, This means that children do not have to walk 5 kilometres to school and back each day. This means that children can go to school earlier as the walk is not too long. This means that girls in particular get more education as they now finish their primary education aged 12 or 13 and can go on to secondary school. Previously girls often finished their primary education aged 16 and felt that it was time to marry at this age and therefore missed out on their education. The co-operative also invested in a bicycle ambulance which allowed people who were ill to get to hospital quicker. This innovation had had a major impact on pregnant women who could get to hospital quicker. This had reduced maternal mortality. The event at the McManus finished with the opportunity to have a tour of the Dundee and the world gallery which was excellent. The refurbished McManus is a project that was well worth the effort in my opinion. 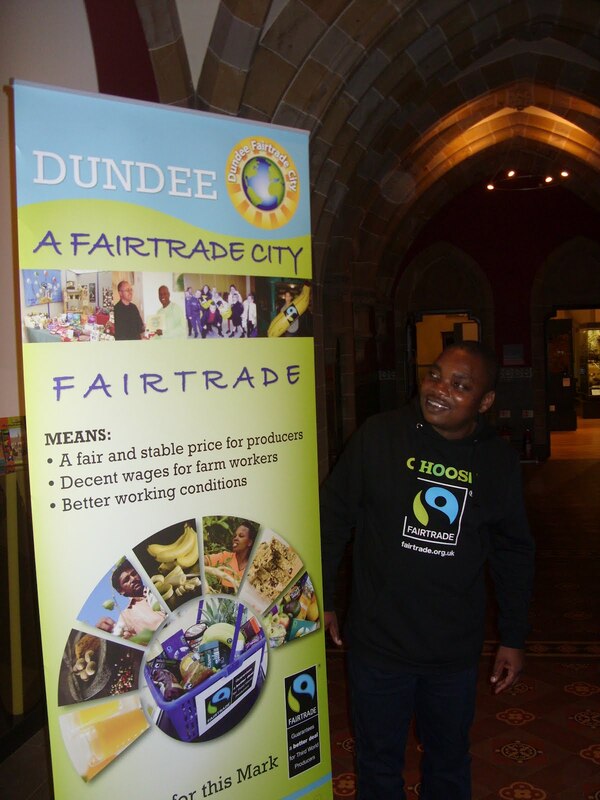 In the morning Masauko visited Morgan Academy and heard about how the school had become Dundee's Fairtrade school. I hope that many other schools in Dundee follow Morgan's example. He then visited the University of Abertay Dundee. The meetings over the last couple of days have demonstrated to me that we need to redouble our efforts to promote Fairtrade. I hope that people will take a step for Fairtrade during Fairtrade fortnight and the next few months. The pictures show Masauko at the meeting tonight and Masauko with Sally Romilly and myself. 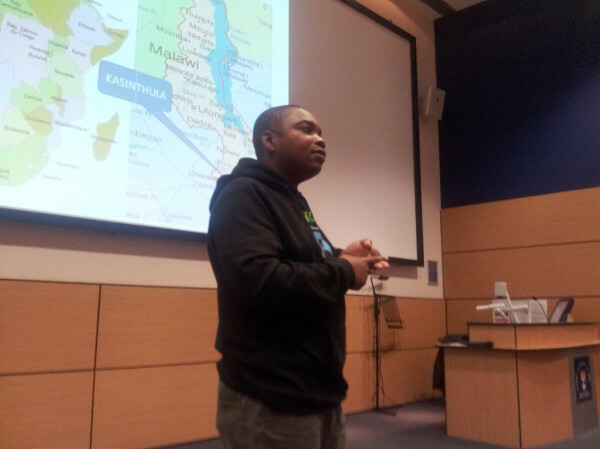 Thanks to everyone who made Masauko Khembo's visit to Dundee possible. 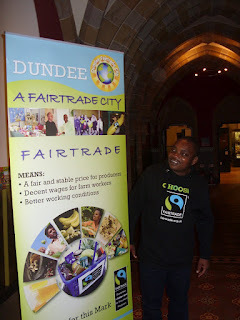 Masauko Khembo a Fairtrade sugar producer from Malawi is visiting Dundee this week as part of Fairtrade Fortnight. Masauko spoke at a meeting in Dundee University last night. It was good to hear from Masauko about the difference that Fairtrade is making to the lives of people in his community in Malawi. It was also good to hear about the work of Fairtrade Schools, particularly from Morgan Academy in Dundee. Thanks very much to the University of Dundee for hosting last night's event. Masauko's story is inspiring and I hope that those who hear Masauko's story will continue to use Fairtrade and will encourage others to do so. Masauko will speak at a further meeting in the McManus Galleries this evening at 7pm, everyone welcome. I attended a meeting of the Olympia Project Board today. This meeting looks at progress towards the building of the new swimming pool and car park at East Whale Lane. The meeting heard about progress and noted that as has been reported in the press there is a delay in the process and the pool might not open until 2013. We also heard about Community Benefit issues. This looks at the number of local contractors, local labour and wider community activity. This is crucially important. There is a major amount of money being invested by the council in the new pool it is only right that the council tries to maximise the return for the people of Dundee with this investment. 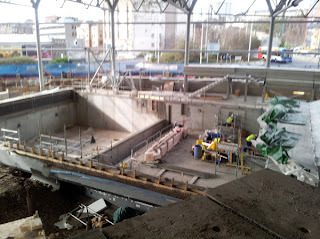 There was also a site visit, it is clear tha t progress is being made and I think that the new pool will be a great facility for the city. I am pleased to see progress on this Labour Party election promise. The pictures show the pool hall and also a picture of the roof of the pool hall which gives some idea of the size of the pools. The Education Committee met on Monday evening, it discussed issues around reserved places in schools to ensure that children who move to an area can get into their local school. We also discussed equality in Dundee's schools. The main item for debate was about car parking and pupil safety. Bailie Rod Wallace put forward a proposal to deal with parking at Forthill Primary School, the SNP proposed an amendment which would have looked at the issue across the city. The Labour Group had prepared a motion which would have encompassed elements of both of these motions. We called for both motions to be brought together but this seemed to be too difficult for a very long time. I made the point that any examination of road safety needs to look at real examples and I raised issues about Blackness Primary and the new campus on Blackness Road. As I have said before it is important that the council and others get it right with regard to road safety at the new schools on Blackness Road. After a tortuous process the SNP mover of the amendment accepted that he meant for there to be a look at individual schools and not just an academic exercise. With this clear and overdue reassurance the vast majority of the Education Committee were able to vote for the amendment. Bailie Wallace failed to convince all of his own group to vote with him and my ward colleague Councillor Donald Hay voted differently from the other two Conservatives. At the Policy and Resources Committee there were two reports on restructuring of the council. These reports will result in some pay rises for senior staff who are undertaking enhanced roles due to the retirements, redundancies and restructuring which have already taken place. My colleague Kevin Keenan rightly highlighted the many other staff at the other end of pay scale who were similarly doing increased work but were not being rewarded for it. Councillor Keenan called on the council to implement the Living Wage. The leader of council claimed that a report will be coming on this issue. I have been calling for the council to implement the Living Wage for some time. I think that the City Council should show leadership and pay the Living Wage and call on those who are contracted to the City Council to do the same, and call on all firms in Dundee to pay the Living Wage. It is clear that a Labour-led council will implement the Living Wage. The Living Wage is supported by a wide range of organisations and paid by the Scottish Government, the Greater London Assembly and Glasgow City Council amongst others. It would help alleviate poverty and put more money in the economy. I am a member of the Board of Dundee Rep. I was really pleased to be at the performance of Steel Magnolias on Friday evening. Yet again the Rep ensemble produce a great performance. This is a poignant and yet very funny play. Whilst it is set in a beauty salon and the cast is all-female there is something for everyone in the play. The video gives some details of performances and interviews two of the cast. Well done to everyone involved in this production. 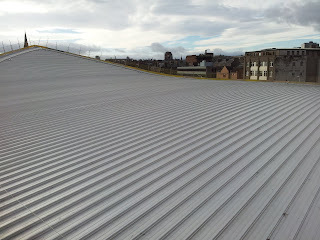 Dundee Rep is an important part of the city. 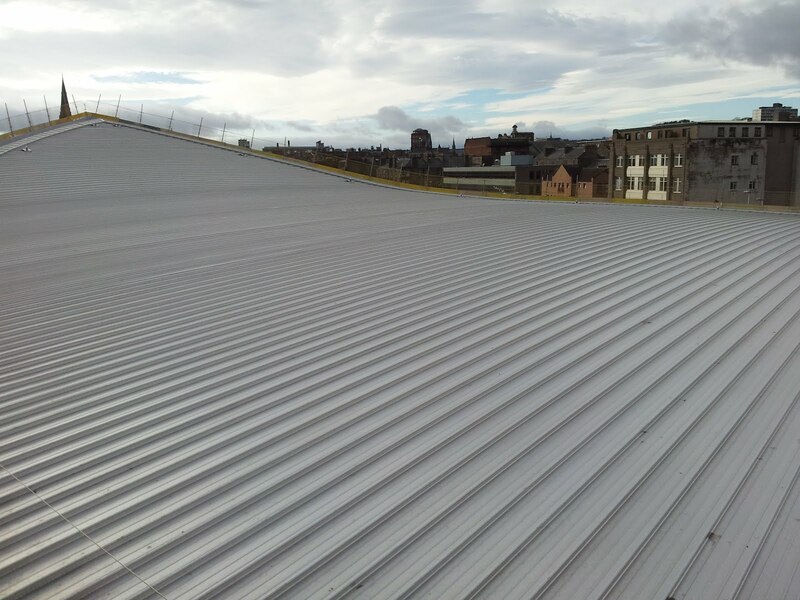 It is great that Dundee has such a great resource. Over the course of a year the Rep has something for everyone. The Artistic Director of the Rep James Brining has recently announced that he is leaving to take a new post in Leeds. James has done a great job at the Rep. I would like to wish James all the very best of luck in his new job. There are strong foundations at the Rep and I hope that the theatre builds on these strong foundations and continues to go from strength to strength. I am very angry at the mindless vandalism which has taken place in Scott Street in the West End. Twenty cars were vandalised with paintwork and windows being scratched. I am appalled at these mindless acts of vandalism. There is no excuse for this sort of behaviour. I hope that the culprits will be caught and I would urge anyone with any information about this incident to contact the police. Whoever did this should be ashamed of themselves. I know that the police will be trying hard to catch the vandals and I have spoken to them about this terrible incident.